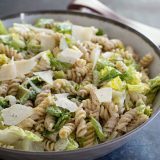 A fresh take on the Caesar salad, this Caesar salad with Pasta is a pasta salad/green salad hybrid that is combined with a homemade dressing for a perfect side dish or potluck salad. Bring a large pot of salted water to a boil. Add the pasta and cook according to the package directions until al dente. Drain and allow to cool completely. In a blender or food processor, combine the mayonnaise, 1/2 cup of the grated Parmesan, the lemon juice, olive oil, mustard, Worcestershire sauce, garlic, and anchovy. Season with salt and pepper. Process until smooth and emulsified. Store in the refrigerator until ready to use. Cut the romaine into 1/2 inch pieces. Place it in a large salad bowl. Toss the cooled pasta with the romaine. Pour the dressing over the salad, add the remaining 1 cup of Parmesan and toss to combine. Season to taste with salt and lots of freshly ground pepper. Top with shaved Parmesan, if desired. **I made 1 1/2 times the recipe and easily served about 50 people (adults and children) as a side dish when people kept their portions fairly small. As a normal side dish, you should be able to easily have 8 generous servings.